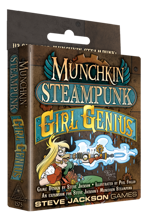 The Kickstarter for Munchkin Steampunk: Girl Genius is chugging along! It funded in less than an hour and is blowing through stretch goals! Go check it out! This is an expansion for Munchkin Steampunk, one of our hottest recent Munchkin games, with all the gear-driven fun, wacky monsters, and valuable treasures you could hope for, including entirely new game mechanics designed by Steve Jackson! This set is lavishly illustrated by Phil Foglio, author and artist for Girl Genius, a long-running, award-winning webcomic about the steam-powered, swashbuckling adventures of Agatha Heterodyne and her motley crew of mayhem-loving miscreants. The campaign ends on November 21 and the game only gets bigger and better the more support we get – become a backer today and broadcast it from your airship so your whole crew knows!